I thought I would share a few ideas with you today, from my Christmas Gift Guide for Tween Girls. My daughter, Lauren, is now 10 years old and she has sadly reached that age where, for her, it's just not cool to play with toys. She really is a mini adult and often chooses similar things to me. We have a lot in common when it comes to our likes and hobbies. This does mean, however, that it has become really difficult to buy presents for her. I don't want to encourage her to grow up too soon, but what I choose needs to keep her interest. I think she would be happy with the choices in this gift guide. Nail Polish Set - This is from Next and costs £12.00. Considering you get 9 polishes, this seems like great value and a perfect introduction to make up without going over the top. Planner - This is from Paperchase and costs £18.00. Lauren really likes planners, as do I. It's a growing trend in the UK and we both like to decorate our weekly layouts. She is in need of a new one at the moment and would love the bright colours on this. Hot Water Bottle and Socks - This set is from New Look and costs £9.99. What a bargain and these would be so cosy to see them through until Spring. I love how they are a matching set. Mason Jar Drinking Mug - This is from New Look and costs £6.99. Mason Jars are everywhere at the moment, but they tend to be transparent. This one is really pretty and stylish with its white design and that 'on trend' gold writing. Lauren would love to have this on show in her bedroom. Watch - This is from Primark and costs £6.00. You are never too old for Mickey Mouse. The black and white design makes this more suitable for older girls and will brighten up any outfit with its neutral design. And seriously...£6.00. Yoghurt Maker - This is from www.easiyo.com and costs £17.99. Hear me out with this one. Lauren wants every gadget maker there is. Donut maker, popcorn maker, chocolate lolly maker so why not think of a yoghurt maker? The idea is that you use sachets and add water and then leave it for 8 - 12 hours or overnight. It lasts for up to 2 weeks in the fridge once made and is gluten free and suitable for vegetarians. And that's it. My Christmas Gift Guide for Tween Girls. Do you have any ideas that I could add to this list? I'd love to hear from you in the comments. 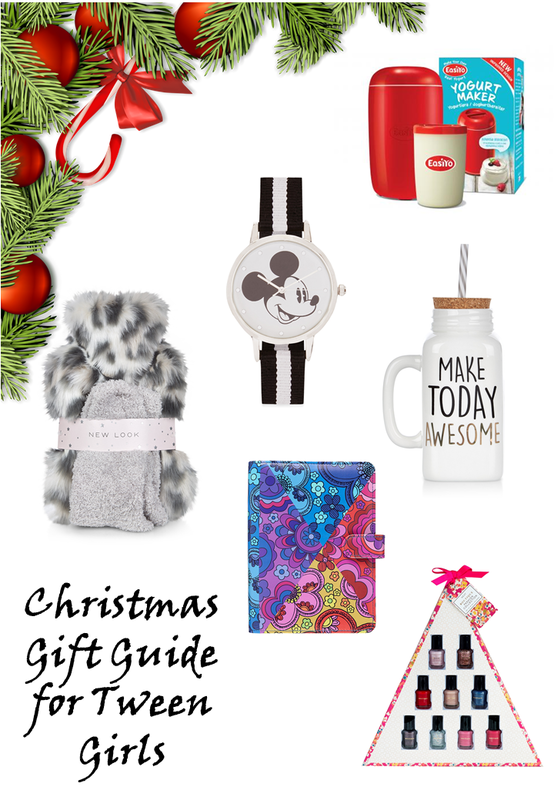 * I was sent the EasyiYo yoghurt maker for inclusion in this gift guide. I have tried it and I am happy with how it performs.